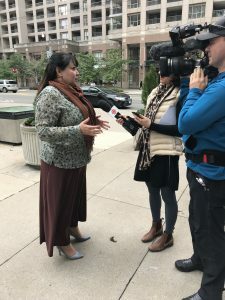 Many of you will have heard about the new health care legislation drafted in secret by the Ford government and revealed to the public by the NDP. We are lucky that this legislation has been opened to scrutiny. It is very far-reaching and it is not in the public interest. I have been following the media. Many of the reports summarize the legislation as creating one “Super Agency” out of the LHINs and quote a warning from NDP Leader Andrea Horwath about the legislation enabling health care privatization. I see that Doug Ford responded in a tweet claiming that the Leader of the Official Opposition is fear mongering. The legislation is an omnibus bill. It would necessitate amendments to dozens of pieces of major health care legislation. It gives unprecedented powers to the Super Agency to order the privatization of any health providers’ procurement and supply chain. It does not define — and therefore does not limit – what “procurement” and supplies could be included. In plain language: the Super Agency would be able to order the privatization of whole swaths of health care and support services. It also enables the Super Agency– made up of 15 appointees of Ford’s cabinet– to order the specific company to which the services are privatized. (!) These powers have never been passed in Ontario law before. They are extraordinary privatization powers. The draft legislation also provides for the Super Agency to create mega-mergers. It also enables the ordered closures of health providers like hospitals without any appeal. Tellingly, the draft legislation took — and significantly enhanced — the restructuring powers of the LHINs into the new Super Agency, but the drafters of the Bill purposefully left out virtually if not all of the public interest provisions that we have won in amendments to the LHINs legislation.‎ Requirements that Board meetings be held in public, and limiting secret meetings? Eliminated. Appeals, more robust public consultations about planning and restructuring decisions? Gone. Requirement that LHINS measure and plan for population health needs: also gone. Principles to guide health planning and restructuring? Erased. It would have been a disaster if the Ford government had finished drafting this legislation and pushed it through the Legislature with very limited time and ability for us to stop it. We will send out a more fulsome analysis in the next week, but if you are outraged about this draft bill, it would be in the public interest that you let Doug Ford and your local Conservative MPP know how you feel. They need to hear about this, in no uncertain terms. More to come. Thank you all for helping to safeguard public medicare for all.